I started this blog with friends, but I was the writer (I use the term loosely). I encouraged some of them to just type what they felt when they were nervous, because I was afraid to blog alone. They did their friendly duty, got excited about the new venture, and wrote their posts beautifully. Now I’m quite comfortable sharing my thought processes, stuff you never wanted to know, the numbers on my scale, and much more. It seems, however, that my friends have better things to do than (over)share about their fitness goals, failures and successes. No, really. I don’t feel like I’m the only person struggling this week because I gave in to sugar cravings while I was PMSing. I don’t mind that no one else seems to want to talk about how the numbers on their scale are exactly the same this week as last week. It doesn’t bother me at all that those busy friends haven’t even commented on my posts in forever lately let alone shared their own stories. I might feel better if I knew that someone else was struggling against their cravings for soda or if another friend (or two) was trying to get back into the groove of a new school year. Knowing that someone else also saw their reflection from a few yards away and realized she is not the shape she pictures in her head might improve my outlook, too. But like I said…I’m fine. This week I’ll read what Kris posts and give her another thumbs up for her awesomeness. The rest of the week I’ll avoid sugar while I try to figure out how to productively spend my time now that all my kids are in school all day. And if no one else posts about their holiday weekend and how it affected their goals I’m sure I can find something else to read. I did just borrow the Guernsey Literary & Potato Peel Pie Society from a friend. When I don’t get any comments on this post I’ll just pretend I’m sweating from my eyes in spin class next week. It’s going to be a great week. Don’t you worry about me…at all. I downloaded a free Kindle book this week not really thinking I would read it, but hey, free is FREE and I needed something new to read on the eliptical! (I haven’t managed to learn to read while running yet LOL) It’s a weight loss book. I have read a lot of diet books. A LOT! You hope maybe this one will have the magic formula. Maybe this one will make it click. Maybe! To my surprise it was not a diet book, but deals with the mental side of losing weight. What our hang-ups are to losing weight that keep us on that roller coaster of a ride with the scale. There is a good exercise in the begining that I thought I would share this week. Why do you want to lose weight? Seems like an easy answer doesn’t it? But what is the true reason? The one that is deep down inside? The one that will keep you going when all else fails that will help you achieve your goal? Sometimes we try to lose weight for the wrong or should I say the superficial reasons. When you are faced with that piece of cake, bag of chips, package of cookies or carton of ice cream, what is going to keep you from eating it? We all get tired, depressed, bored and hungry and what is going to compell you to stick to the program? When those items are screaming your name and every fiber of your being is trying to sway you to give in, is your reason strong enough to prevent you from caving in? Often it is not. The candy bar or cookies or whatever, are stronger than the idea of looking good for an event or fitting into an outfit. They are right there in front of you, in plain sight and all of your goals, the reunion, the outfit- whatever it is for you- is in the background by comparison. That’s not to say you won’t ever be able to say no, it just not a switch to just turn off. If you haven’t already realized your true purpose for losing the weight, you should find it. Stop and get clear on why you are doing this. I want to live a long and healthy life with my husband. I want to travel and not feel restricted in what I can do. I want to go to an amusement park with my kids and not panic at the weight limits or if I can fit in the seats. I want to look in a mirror and be proud of what I see. I could go on, but how about you? Is it something deeper than a New Year’s resolution, that will keep you going to reach your purpose so that the lure of the cake won’t even come close. The exersice of the “5 Whys” is to ask a question 5 times, at least. You may even need to go deeper than 5 to get to the route of why you are trying to lose weight. Really listen to that inner voice. Why do I want (or need) to lose weight? So I can feel better about myself. Why do I need to feel better about myself? Because my weight hurts my self confidence. Why do I need to increase my confidence? So I am willing and able and not afraid to do all the things my husband and kids would like me to do with them. Why am I afraid to do the activities with my family? Because I know I won’t have the energy to keep up or to to it correctly, fit in the seat, or I’ll be laughed at for even trying. Why do I want to have more energy? Why do I want to lose weight? I want to be an active participant in my own life and not a spectator. When you know your true reasons, write them down and look at them as often. When you are faced with a temptation, count backward from 100 and think of those reasons. By the time you get to 1 that ice cream will look less appealing. When you don’t really want to hit the gym, read your reasons again. We can do this and when we know why we have much more motivation to endure the struggle and reach our goals! I haven’t met you, but I appreciate you all and cheer for you everyday! The fact that I gained less than half a pound this week is a success to me. I…well, hold on, T.M.I. ALERT: If you choose to continue reading be warned that I’m not holding back on the talk about girl stuff that tends to make some men uncomfortable. So! In the past year or so my periods have been closer together (like every 3 weeks!) and have gotten heavier….have to get up in the middle of the night kind of heavy. I just chalked it up to getting older, and find it ironic that I’m in a stage in my life where I know I’m finished having kids and am ovulating way more often. Not fair (in a heart beat I’d trade with my friend who has been trying to have a baby for a long time). Last weekend I realized that I had not had my period in 5 weeks. Holy crap. I started to panic and “What ifs” were filling my head. I convinced my self that it was fine and I should just wait until Wednesday – give it 4 days. By Monday I was in full panic mode. 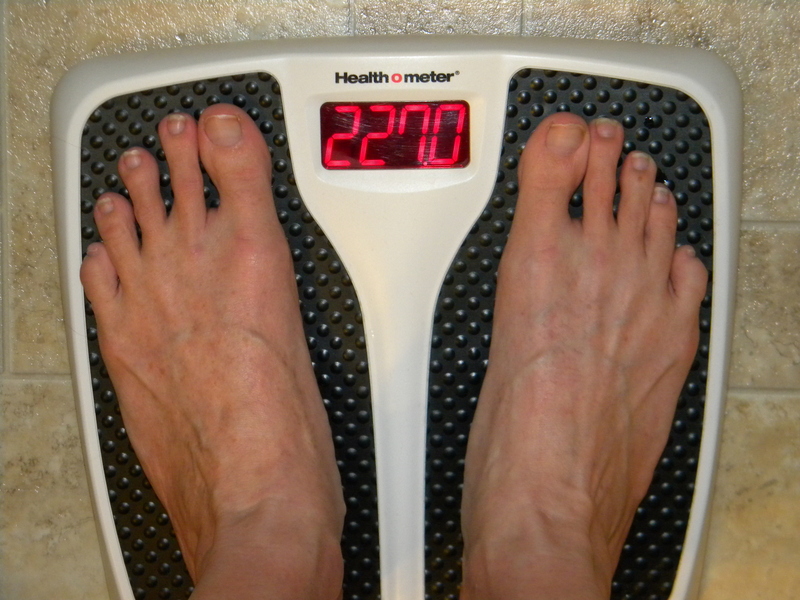 If I was…you know (I still can’t even say it) then how would I blog about weight loss? The half marathon would be totally off the table. How would it affect my taking college classes? Would my husband have a heart attack? Panic. Tuesday morning I made an unnecessary trip to Wal-mart…the furthest store from where I live so I’d be less likely to see anyone I knew. I bought the test, drank lots of water and headed…to the track. I wasn’t ready to face the music so I walked 2 miles. The whole time I was concentrating on good posture, keeping my stomach in, watching the track team practice, and not thinking about the Wal-mart bag in my car. When I got home I really had to pee. Time to face the music. It didn’t take long to see that I was worrying for no reason. HUGE sigh of relief. Then Wednesday morning I started…with a vengence. I have had horrible cramps, my body has felt like it was on fire, and I’ve been bleeding uncontrollably. I’ve been craving carbs and fat and wanting to lay around in bed with a heating pad on my lower back. Good times. I still got 4 workouts in. I only drank one soda. I indulged only slightly in some dark chocolate…and a shake on date night with the hubs. A relatively good week for one invaded by Evil Aunt Flo. This coming week I need to keep up my regular workouts and maybe add an extra since it’s my last week of freedom before classes begin, use gum to curb my cravings, and make sure I’m getting my veggies in. Aims is preoccupied this week with things I’m sure we’ll hear about next week. Hopefully, with pictures. Did you hear that, Aim!?!? In the meantime, I must apologize for not update our Who’s Weighing In page with info on our new bloggers. We’ll work on that. But seeing as how I can’t even write my own snippet…someone else better work on that. Volunteers? That’s right: Apple Pie. 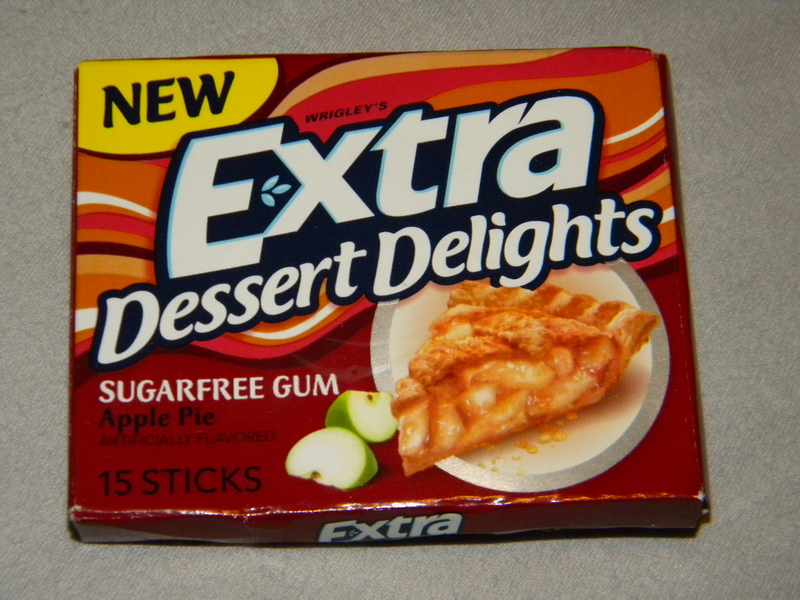 And let me tell you….it is like chewing gum from Willy Wonka’s factory. Apple pie! Delish! If you want to skip the calories but not the flavor this Thanksgiving (or tomorrow) pick some of this good stuff up. Anyone tried the Key Lime or one of the other flavors? So to sum up: Chew gum. Aims has better things to do. Don’t hold your breath on the Who’s Weighing In update. I’ll admit that I was naughty this week in that I didn’t track every single day every single thing I ate. A weight watchers no no. However, I’m pretty sure that I didn’t eat more than my points allowance for a day. I am that familiar with the program. And even if I wasn’t sure how many points I was eating I was cutting my portions down quite considerably from what I would have eaten before I started weight watchers, so I consider it a success. This week was hard craving wise. I can’t handle open bowls of candy right in front of me. We went over to my in-laws and made gingerbread haunted houses. Oh my torture! Especially after cream and cheese soups and rolls. (I may need to figure out what to do about eating there. I don’t want to blow all my weekly points by eating Sunday dinner there. Any recommendations would be nice.) I ate a few sixlets and luckily candy corn offers no temptation to me at all. Those were the closest bowls to me. I said no to the ice cream and had one pumpkin cookie. I was proud of myself. But ever since then I’m like craving little candys. Did you know half a bag of peanut butter M&M’s is only 3 points? I find more and more three points used for candy, when they should be used for dressing and croutons on a salad. I heard once that your body craves what it needs. There is no nutritional benefit from candy. So why am I craving them? I don’t know if any of you use Pinterest, but I am hooked being the crafty DIY girl that I am. (Have I mentioned monday is my two-year olds birthday and I’m making everything including party hats with mickey mouse ears, cupcake wrappers, and decorations to name a few?). Back to my point. I was on pinterest the other day when I saw someone post this awesome chart about what you are craving, what it means your body is lacking, and a healthy alternative to eat. I thought it was awesome so I’m posting it here. . It originates here. So according to this chart, I need to find some nuts, legumes or fruits. Awesome, because fruits are 0 points on weight watchers. What do you crave? What can you try to replace it with?